“Some people are accident-prone, Kim, but so help me, you’re adventure-prone.” So said Dan Aldrich to his daughter, Kim Aldrich, at the beginning of Miscalculated Risk, the first book in the four-book series published by Whitman between 1972 and 1974. 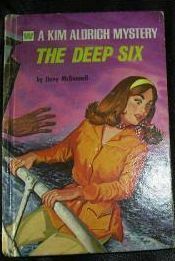 Written by Virginia Bleecher McDonnell (probably better known for her writing the Nurses Three series under the pen name of Jean Kirby) under the pen name of “ Jinny McDonnell,” the series of mysteries takes young Kim Aldrich from one danger to another as she seeks to help those around her. Kim is a young secretary at World at Large Insurance Company (a/k/a WALCO), where she works in the legal department under Mr. Rydell. She is the youngest of three children – her older brother, Tom, is a co-pilot with Panoramic Airline, and her older sister, Cindy, is a nurse. Her father is an FBI agent, always away on one mission or another. Kim often is left to her own devices with the assistance of Gerta, the plump family housekeeper who has lived with the Aldrich family since the death of Kim’s mother some time ago. Kim is quite the skilled young lady – educated at Miss Axminster’s school of secretarial skills, experienced with judo, having top notch swimming abilities learned from the Red Cross, proficient in sky diving, skin diving, and even in flying two and four engine planes! Despite all these skills, Kim has a tendency to let her imagination run wild, creating scenarios in her mind from the unbelievable to the downright scary – and in some instances, such scenarios have saved her life, while in others have given her unnecessary frights! Kim is also no stranger to love. In each book, Kim has a different love interest, a different man to whom she finds herself immediately attracted. Sadly, each man never goes beyond one book - while the previous mysteries are mentioned, the love interest from the prior book is conveniently left out. 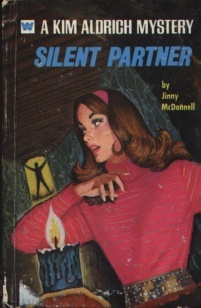 SILENT PARTNER (1972) was the second book in the series. After the events in the first book, Kim decides a vacation is in order, and heads to the little Alpine town of Alpenschloss – where she meets Jim Winthrop, an intriguing man who has a young boy (12 y/o) named Roby with him. When she is using a video camera to film the two new men in her life, she inadvertently films a situation involving other skiers – a man has his poles taken from him, a chase ensues, and a man is gravely injured! When the patrolman who is taking the injured man back to the chalet runs the sled over the edge of a cliff, killing both himself and the injured man, Kim is thrust into another deadly mystery. 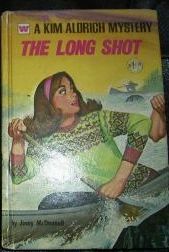 THE LONG SHOT (1974) was the fourth and final book in the series. Kim is asked to act as a camp counselor at Camp Algonquin, an old camp that she used to attend every summer, in order to watch over the daughter of a client of WALCO, who has been threatened with kidnapping. Kim reluctantly agrees at her boss’ insistence, and soon discovers that Robin Van Alstyne is a terror to deal with! Constantly running away, creating trouble, and mocking all around her, Kim begins to think she is in over her head. She nearly loses the girl before they leave NYC, and then at camp, she disappears in the middle of the night! Robin is nearly abducted on a horse ride when the young girl takes off ahead of the group, and when the entire cabin goes on a canoe trip, Kim is worried when three men who are renting a canoe at the same place keep eyeing Robin. Danger lurks around every corner, and when Robin disappears, Kim and a male counselor begin a dangerous search – where not only does someone posing as a ranger trick them, but they discover a body at the bottom of a well! It’s a race to rescue the young girl before the kidnapper takes them out as well! Despite the fact these mysteries are written for young girls, the themes in the books, ranging from kidnapping to drug smuggling to murder, seem a bit more adult-oriented, particularly for the time they were written. They are enjoyable reads, however; certainly worth a read if you get the opportunity! Copyright © 2002-2005 by Jenn Fisher. All Rights Reserved. Nancy Drew® and the Hardy Boys® are registered trademarks of Simon & Schuster, Inc. All rights reserved. This site is neither affiliated with nor endorsed by Simon & Schuster, Inc. Any of Simon & Schuster's Copyright material appearing on this site complies with fair or acceptable use principles established in U.S. and International coypright law for the purpose of review, study, criticism, or news reporting.